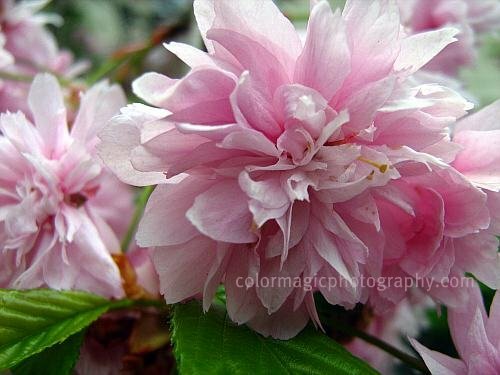 This beautiful pink, double flowered cherry variety is a Japanese cherry-Prunus serrulata Kwanzan. 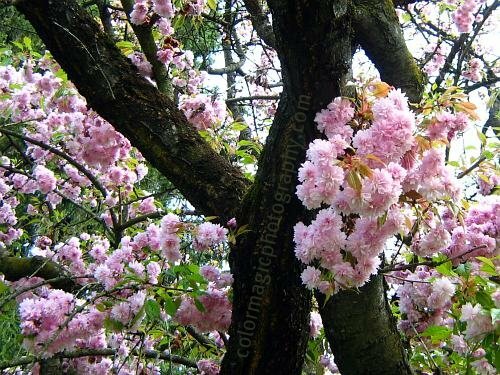 Most cherry trees blossom in early spring. Japanese cherry tree varieties with blossoms of more than five petals are called yaezakura and these trees are the last ones to open their blossoms. They bloom two to four weeks after most five-petaled species. The fresh leaves are coppery brown and they arrive together with the blossoms. 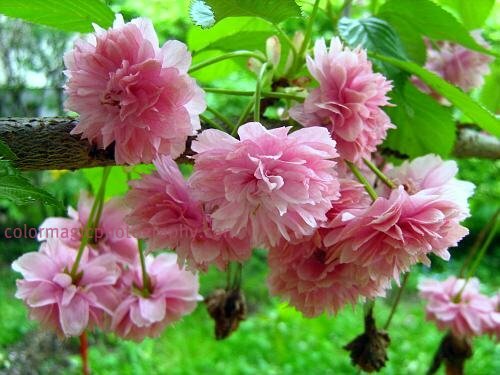 One Kanzan cherry blossom consists of as many as 30-50 pink petals. The flowers are produced in clusters of two to five together at nodes on short spurs. These beautiful cherry trees are grown only for ornamental purposes, not for their fruits. They often suffer in our climate, when winter suddenly comes back in May for a few days, like this last week. Ice Saints are coming but they are too early this year. Don't know what Ice Saints are? In many European cultures ( Flemish, Dutch, Hungarian, German, Austrian, Polish and Swiss) legends refer to late-spring cold spells that frequently bring May frosts. The Ice Saints are St. Mamertus, St. Pancras, St. Savertius and St. Boniface. Their "feast days" fall on the days of May 11, May 12, May 13 and May 14 and these usually are a sequence of icy-cold days when night temperatures sink to freezing point. It is a reminder for farmers and gardeners that plants and crops must still be protected. By us Hungarians, the last Ice Saint is Orban on May 25. Because of the expected May frost, sensitive plants (cucumber, tomatoes, beans) are planted only after the ice saints. A beautiful Orban day means a plentiful year. So beautiful, absolutely amazing beautiful. Oh my goodness the cherry blossoms are beautiful. God is so good. so sorry to hear that you are not well, praying for your good health... you have amazing works of art and photography! Stunning! but they don't last very long in our tropical heat. These blossoms are so gorgeous Maia. Thanks for sharing. Oh Maia, the cherry blooms are gorgeous. I am amazed at how many blooms are on the trees. Macro Flowers Saturday is back!